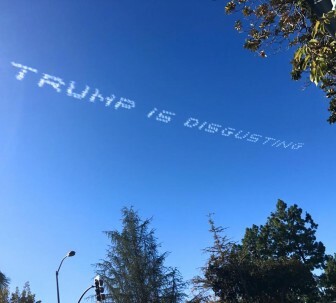 Last week, Stan Pate, a wealthy real estate developer from Tuscaloosa, paid for an anti-Donald Trump skywriting campaign at the annual Tournament of Roses parade in Pasadena. (Photo/reddit.com) A message over the skies of Pasadena during the Rose Bowl parade is indicative of division with the GOP during primary season. Pate’s effort is just one of the more high profile salvos fired in the interparty squabbling known as the U.S. presidential primary process. And every election cycle it’s the same thing — people who generally agree on 75 to 80 percent of issues go nuclear with one another over which of their party’s candidates is the best choice for leadership, ideological purity, experience and the best challenger against the opposition in a general election. It happens on both sides. Democrats arguably had their nastiest fight in party history during the 2008 Democratic nomination contest between Barack Obama and Hillary Clinton, when there were numerous charges of racism and sexism. Indeed, the so-called “birther conspiracy” about Obama’s citizenship originated with the Clinton campaign. Eight years earlier, a similarly ugly fight erupted between George W. Bush and John McCain, when there was a whisper campaign on the eve of the South Carolina GOP primary that McCain had fathered a black child. This year, we may see this sort of thing taken to the next level. In previous presidential elections, by the time the late-summer political conventions came around, most everyone had made up and the other candidates rallied around the presumptive nominee. Old enemies buried the hatchet and set their sights on helping the party win the general election campaign. It’s not clear that will be the case this time. In this election cycle, it has seemingly become even more vicious, as the insurgent candidate Donald Trump has taken the conventional campaign wisdom like a bull in a china shop, leaving a lot of us scratching our heads and wondering if those old tactics are now officially obsolete. If Trump is the nominee, having won the GOP nomination using unconventional tactics, what will that mean for the tradition of former adversaries on the campaign trail making amends in the general election? Furthermore, will that mean your run-of-the-mill Republican voter who found Trump repulsive months earlier and supported someone else will unite with him? In this day and age, there is a handful of people so invested in politics they treat it like they are rooting for a favorite sports team. For some people, Trump is their version of Alabama football. If Trump doesn’t win their Iron Bowl and go to the championship game, not all those supporters are going to get behind Mississippi State or Arkansas for sake of conference unity. That’s something not only Trump has to worry about, but also the other candidates still in the running that still could win the nomination. The idea that at the end of the day, all Republicans will unite to support their candidate is no longer a given. There are some who believe this why Mitt Romney lost to Barack Obama in 2012. As a Republican candidate, he was so uninspiring that some rank-and-file conservatives stayed home in key states that could have been won by the Republican Party. On the Democratic side, this doesn’t appear to be a threat. Although they are fewer in numbers, Bernie Sanders supporters will still vote for Hillary Clinton if she winds up being the eventual nominee. That could wind up being a strategic advantage for Democrats, not just in the presidential election but for all the down-ballot races as well. There’s another element here, the so-called “inside the beltway pundit class.” While its role in our politics is exaggerated, it does fuel a lot of the back-and-forth in national politics. For that reason, they are a part of the circular firing squad and have not warmed up to Trump at all. And on Hillary Clinton, they’re lukewarm at best. So if it is Trump versus Clinton 10 months from now, it’s hard to imagine one of them penning a fawning column about the crease in Hillary’s pantsuit or the first-class temperament of Donald Trump, as others wrote about Obama in 2008. Could a lack of consensus among political pundits impact the election? If National Review is still pooh-poohing the idea of Trump or Cruz as a Republican nominee, that could make it tougher. For now, the Republican and Democratic national committees are doing as they always do in these primary fights — they’re focusing their attacks on the candidates on the opposite side, while trying to remain neutral throughout the primary process. That’s fine for now. However, whichever party apparatus does the best job reuniting its members, be it rallying Bernie Sanders supporters in Hollywood for Hillary Clinton or talking the Stan Pates of the country into supporting a “disgusting” Trump, could determine this election. For now, that appears to be the Democratic side.